Astrophotographers 'hate' sky background at night time. This is worst in cities of course with all the street lights, Billboards and what not. We live on the ground and we light up the sky only because we are careless. Here is a simple data from a series of images i took from my observatory. Starting from 1 sec and doubling the exposure with each image; these are seven in total. Celestron C14, SBIG ST9XE CCD camera, Astrodon Luminance filter (and more) was used to acquire this data. Notice a perfect linear relationship here (notice R^2 value). 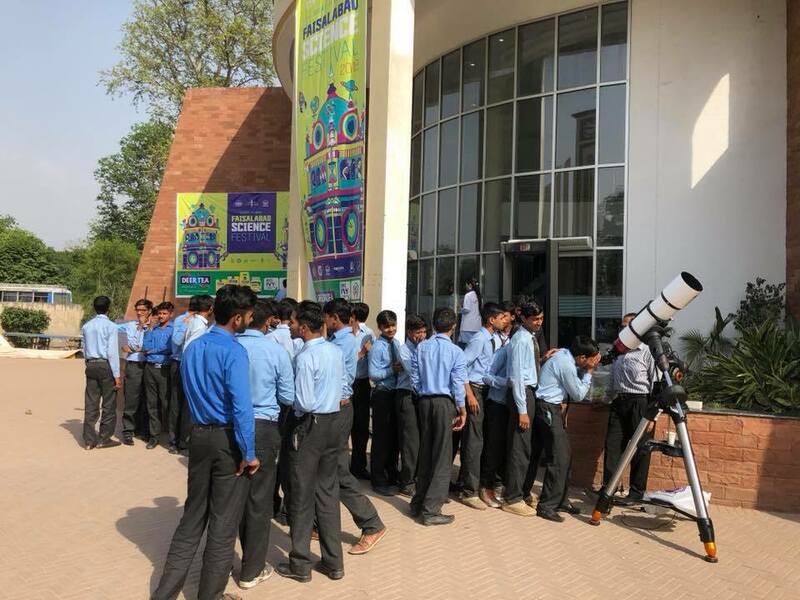 CCD cameras have excellent linear response to star light photons and here, sky background photons. This is the reason we like CCD's or CMOS for that matter (until they remain linear). CCDs are always better than CMOS.. there are many reasons for that. I have attached a short clip of these seven images as well.. you will see very few stars in a single second exposure and many more with increasing exposure. Telescope was not being guided so you will see black bands in the images; this is the result of aligning unguided exposures. 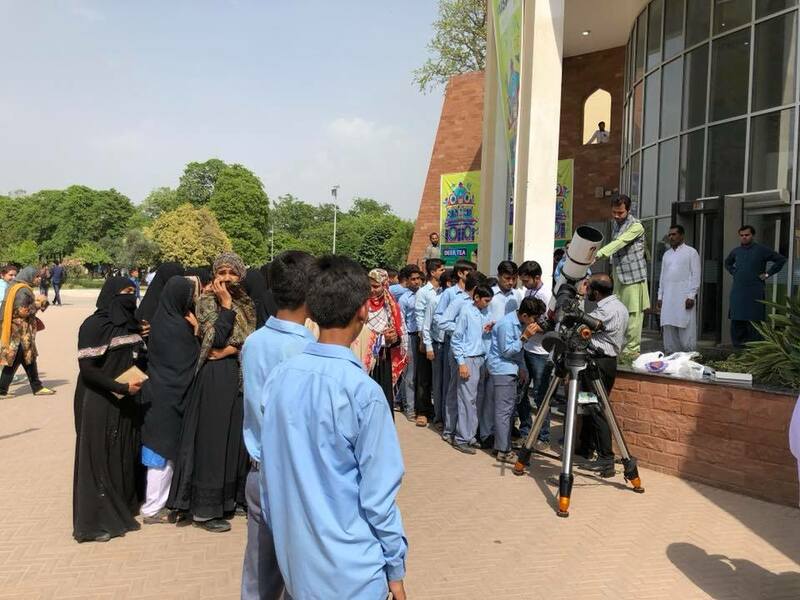 Sunday is the only day when i can do anything with my solar telescopes. So today was a blessing when the sky was clear. I have Lunt 152 Halpha telescope which shows the atmosphere of our Sun so nicely. 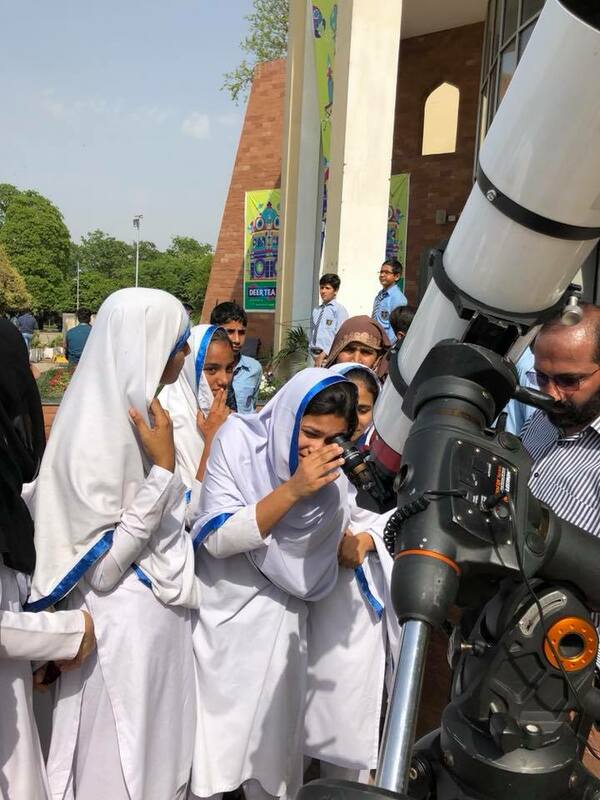 With ZWO 174 mono camera and imaging at 130 frames per second helps a lot to find the sharpest moments in the earth’s atmosphere which is always a problem for high resolution solar/planetary Imaging. Above image is the stack of 4000 sharpest from about 20,000 frames. AVIStack, Registax and Photoshop was used to produce this image. Asteroid 433 Eros is famous because in 1998 Space Probe NEAR Shoemaker visited it and gave us stunning views of this asteroid. The above image is a stack of 263 images; each image was of 5 seconds exposure in luminance filter. 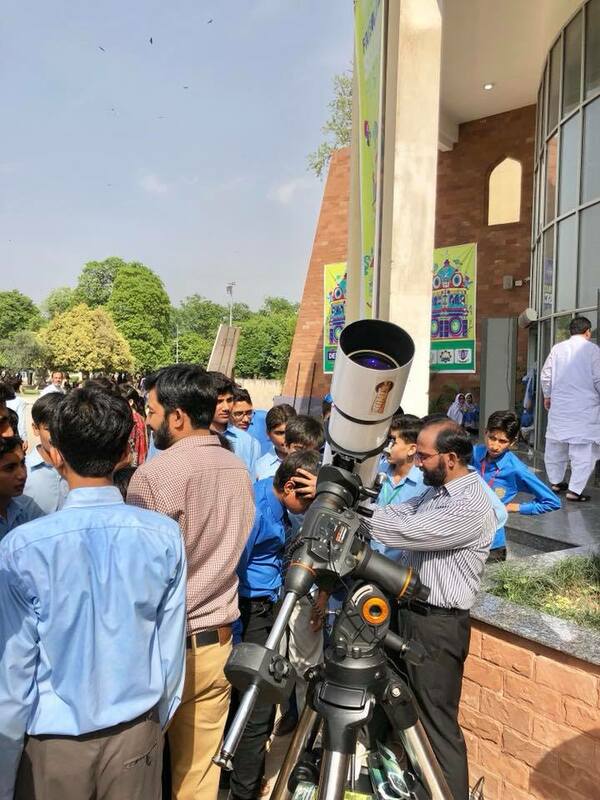 Telescope was being tracked but not guided. The Asteroid was moving from right side of this image to left. The time of image acquisition was 30 minutes. Top right has a beautiful close visual binary star which are almost 9 arcseconds distant from each other and both have about 7 magnitude brightness. Hipparchus Star Catalogue has it with an entry as HIP 21108. Orion is dominated with many Deep Sky Objects; the crown is of course the most imaged nebula, M42. In the same constellation lies a reflection nebula which is cataloged as NGC 1788. It is 1300 Light Years away from us and is located about 5 degrees North from Rigel. It contains extremely young stars and shines with the reflection of these stars’ light. I do need to collect more photons from this object which i will in coming nights. I will also image this object in Infrared band. NOMAD shows that at my location with Luminance filter i can go a bit beyond 18 magnitude around 50 degrees altitude south side.. it is two magnitudes deeper than my previous location. Above is the graph of autoguiding errors from The Sky X Pro.. Left side is the latest. Notice the ‘Guide Star’ was behaving a lot better a while ago but it started to jump all around before i stopped the imaging run. This happened because the Seeing got worst! 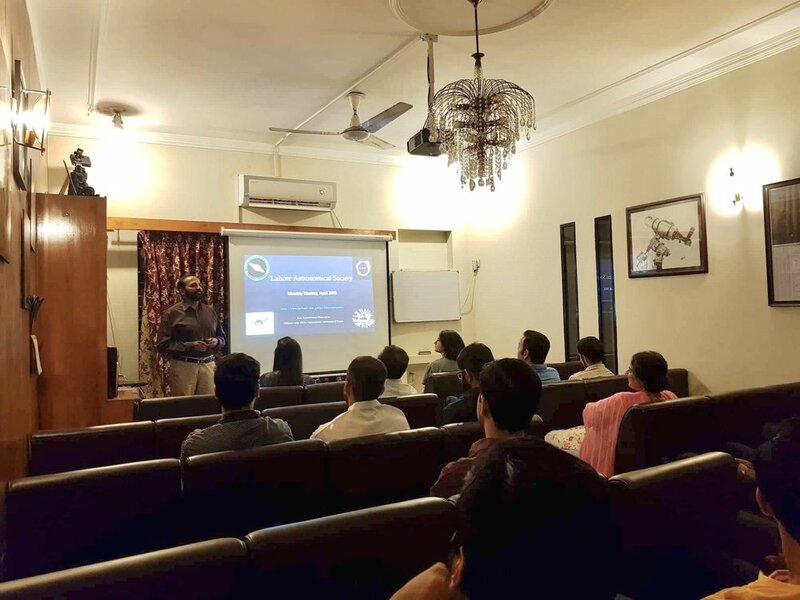 SPADES is a Science & Engineering society at The Lahore University of Management Sciences. 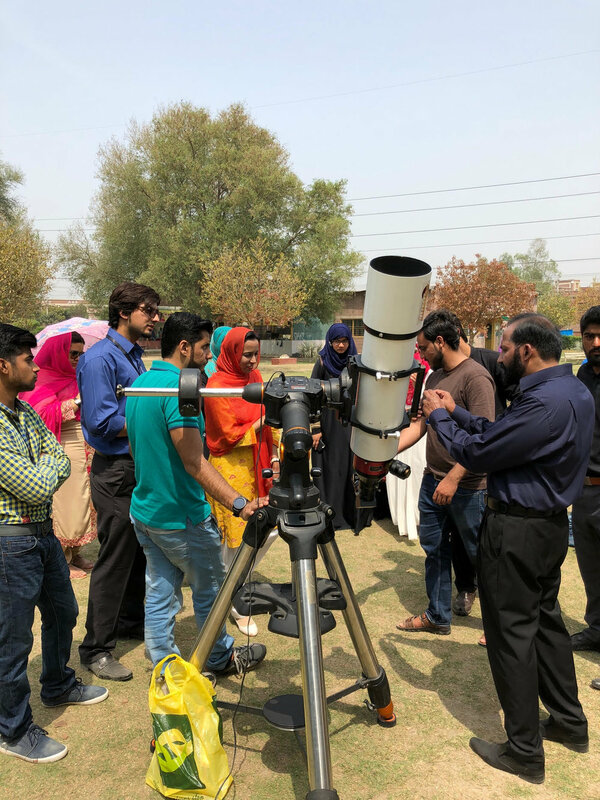 They organised a symposium on Astronomy where i talked about basics of Astro Imaging. 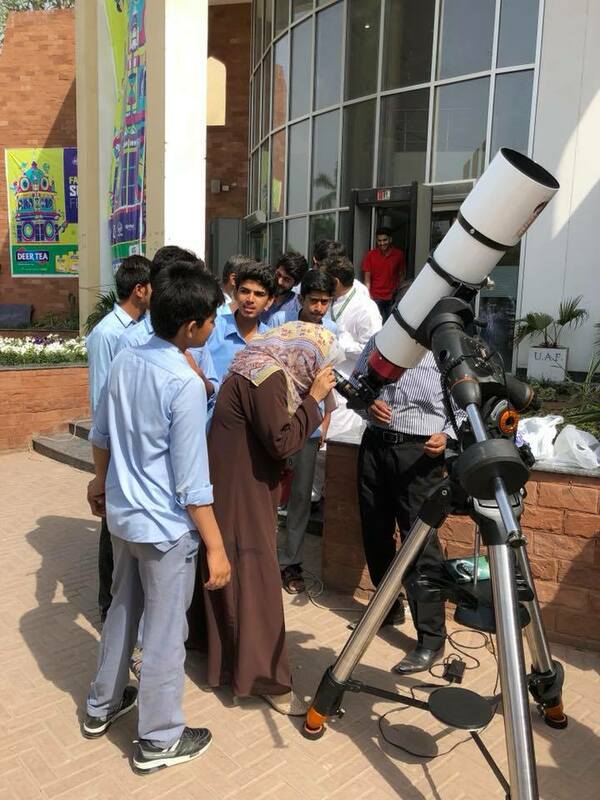 Solar outreach at UMT today in Lahore. 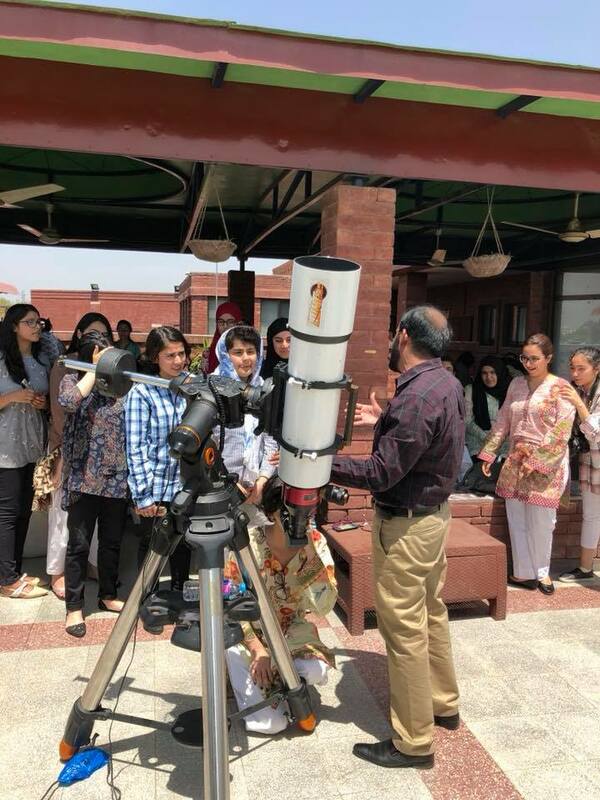 Started with delivering a presentation on our Sun and how to see it safely and then moved out in the ground for the observation session. Some 100 people showed up.. asked many good questions! So the highest temperature today went to about 35 C. I kept the roof of the observatory closed and opened it around 22:30. Notice the sudden dip in the upper graph. This shows the sudden release of the heat trapped inside the observatory even after 4 hours of sunset and then the heat loss ratio became stable. Lower graph shows the temperature loss outside the observatory.. of course no sudden dip around 22:30. The weather is getting hot now.. 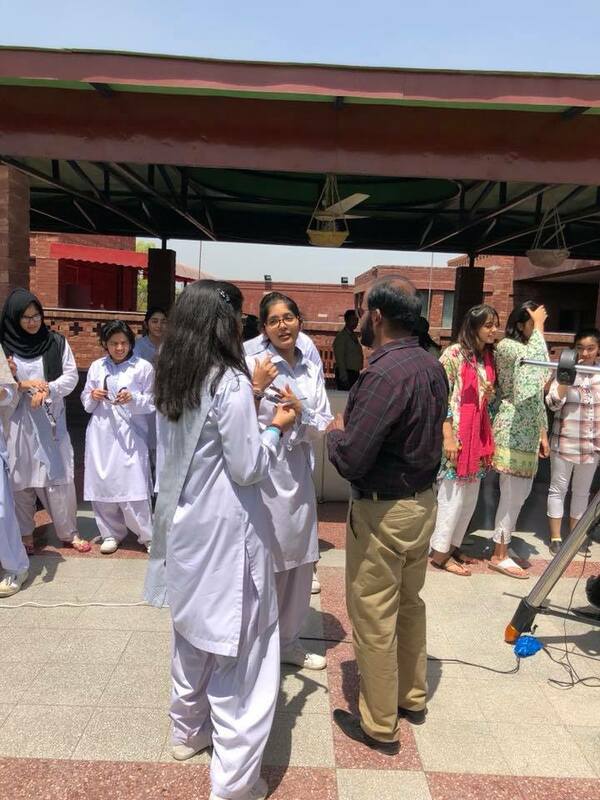 In the direct sunlight, it is getting hard to stand and keep talking to hundreds of students.. of course, who cares about that! Today i met super charged students of LGS EME branch.. Some 400 kids from 6th and 7th grade. 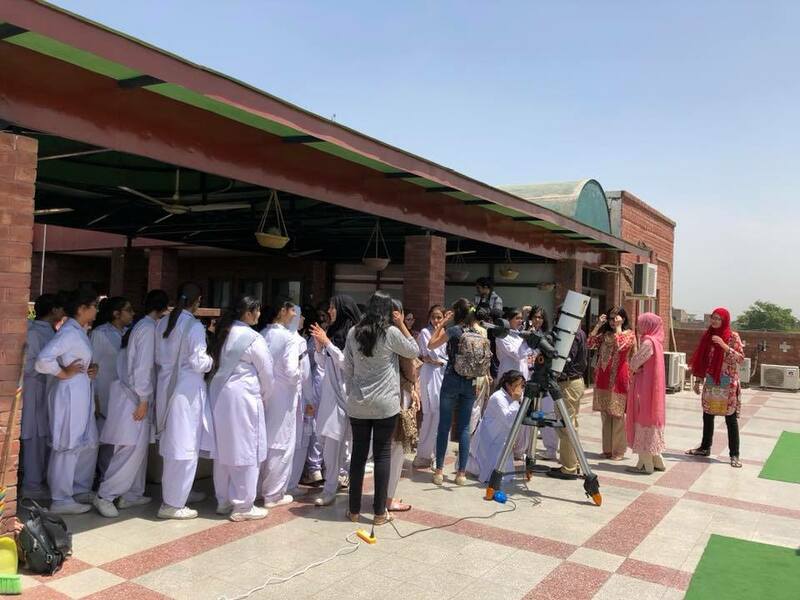 They saw the Sun through Solar Glasses donated by CBSAP and my Lunt 152 Hydrogen Alpha Solar telescope; i use this scope with B3400 which gives a bigger field of view of the Sun. 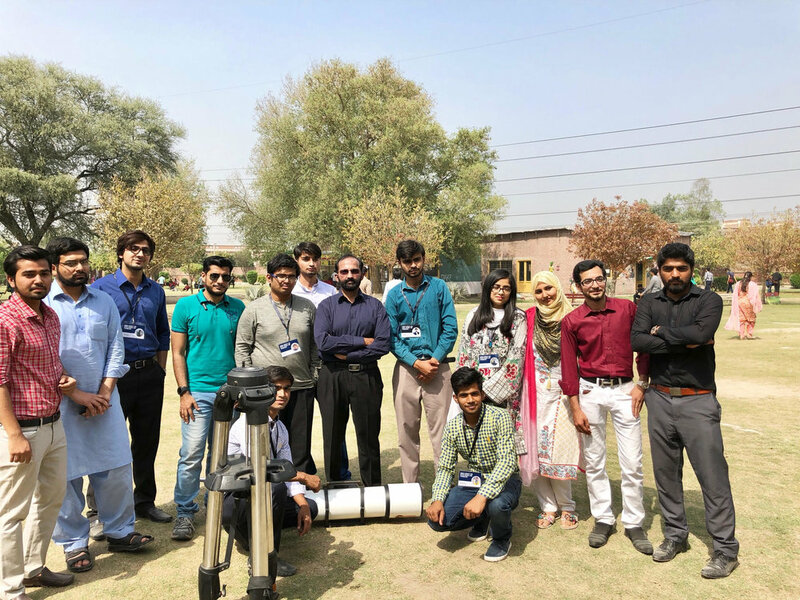 They were shooting questions about every thing they could think of in the entire Universe.. Extra-terrestrial life forms, Black holes, Alien planets, Formation of Stars, planets and moons, Space Missions and what not! I was speaking at the maximum possible speed my sound system could manage with continuously taking water to keep it running. At the end of it all, some 3 hours later, the sound system broke and i am very very happy with that! 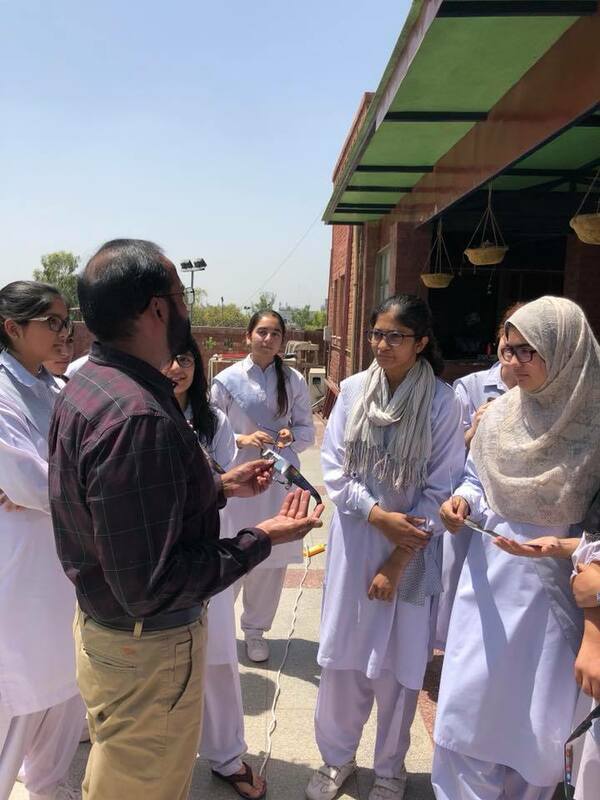 Students of LGS EME, you are great! 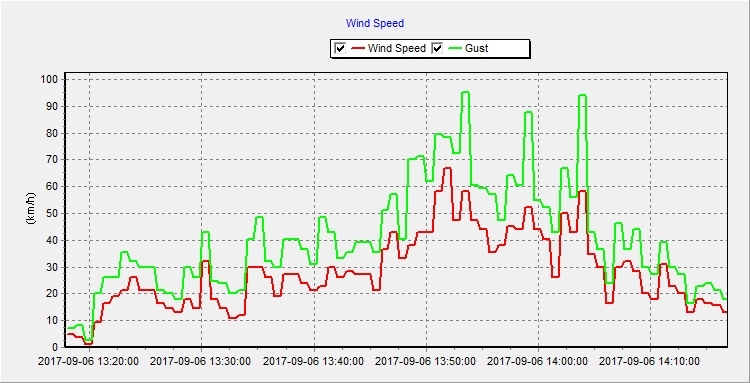 This is the graph from my Weather Station at the observatory.. Upcoming three days are predicted to bring thunderstorms. The following is the highest wind speed recorded at the observatory last year. The blue line is indicating rain here.. Red line are clouds and the yellow is daylight. 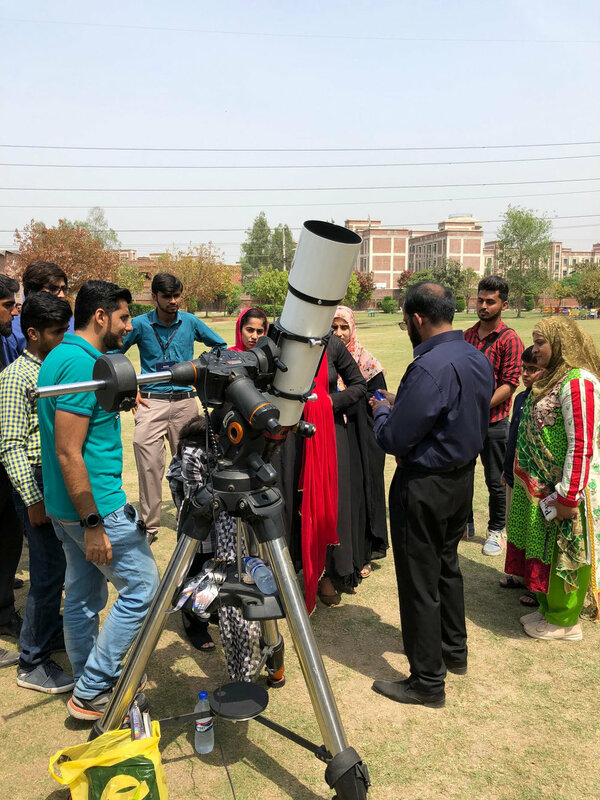 Lahore Astronomical Society meets every first Friday of every month, except Ramadan. 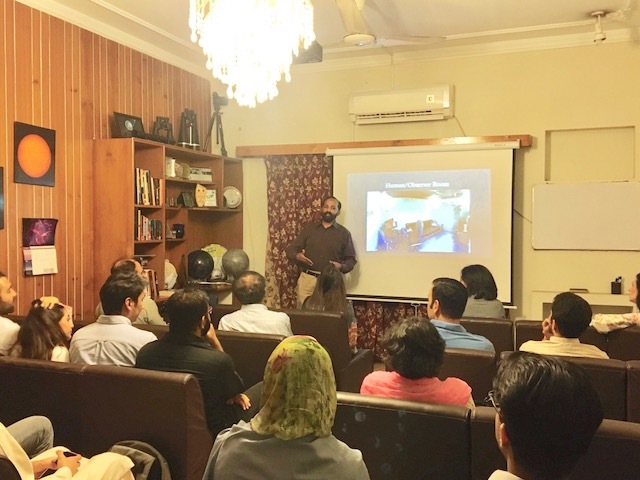 This month it was yesterday where Schehrzade Syed gave a presentation on Life of late Stephan Hawking and his most famous works. It was extremely entertaining and there were many video clips embedded. 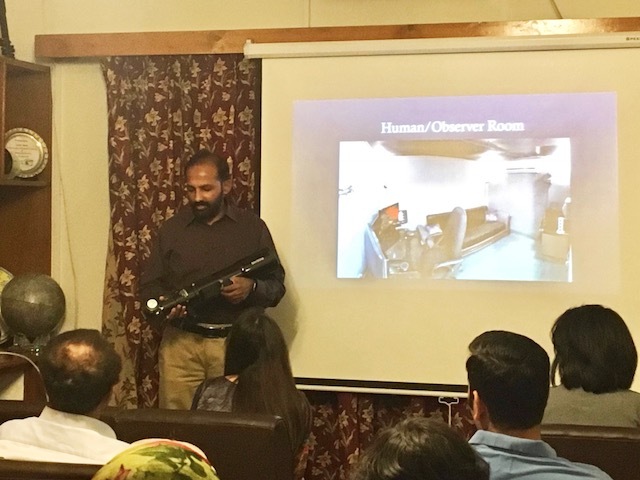 I felt like i was meeting with the family & friends of Hawking through the entire presentation. Being under the burning sunlight, standing for hours, constantly talking to hundreds of people, continuously repeating every time to a new observer what to see, how to see and what is being seen.. this all does not drain me at all; On the contrary, it gives me such energy which i cannot explain in mere words. Just give me a crowd.. hundreds? yes.. thousands? even better! I have been doing it for decades and will do it everyday.. all my life! 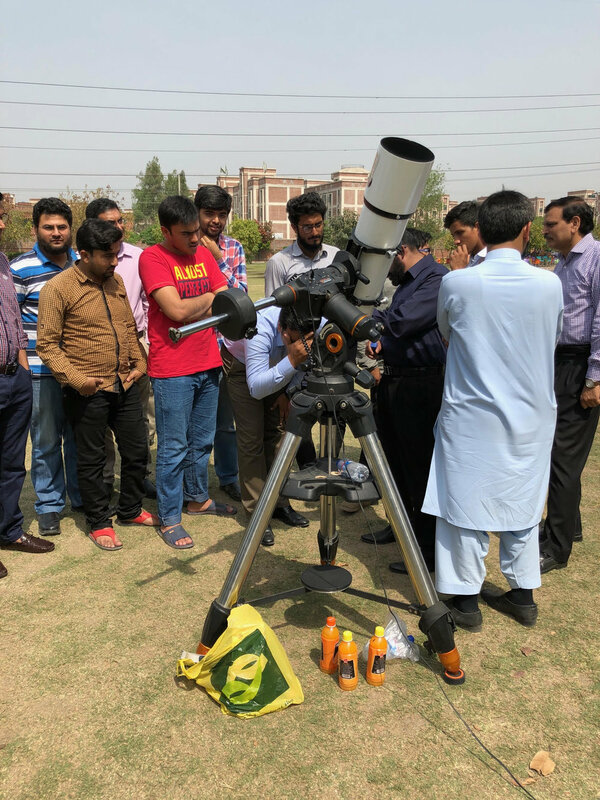 Today i went to COMSATS, Lahore and took my Hydrogen Alpha Solar Telescope with me, CBSAP Glasses and spectral rings. 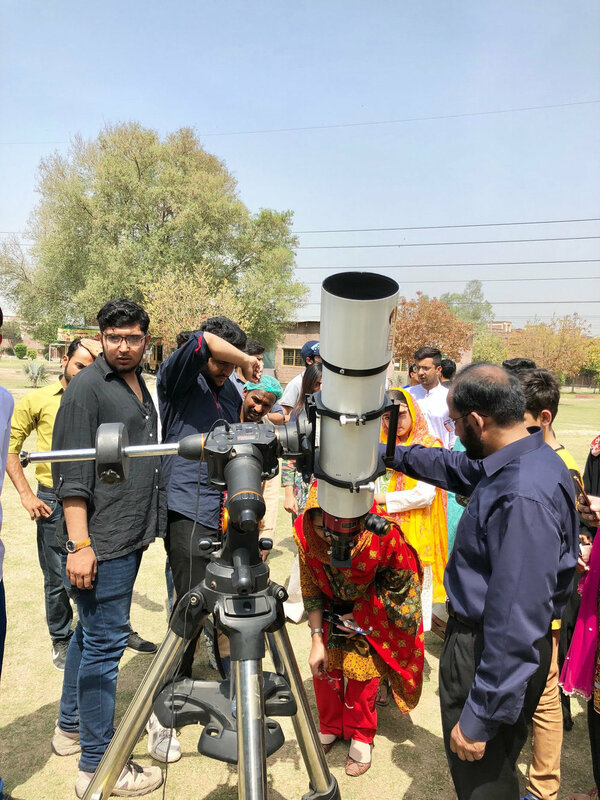 Alpha who is new to our Astronomical Society's core group also came and helped a lot!